예천용문사영산회괘불탱은 입상의 삼존불상을 배경으로 본존불상 머리 좌우에 가섭존자와 아난존자를 배치시켜 5존도 형식을 취하였다. 삼존불상 가운데 통견(通肩)의 적색 대의(大衣)에 밝은 회청색 내의를 착용한 본존 불상은 머리 높이가 180㎝이고 머리 광배의 폭만도 무려 273.㎝에 이르러 10미터가 넘는 화면 전체를 다 차지할 정도로 큼직하게 그려져 있다. 적색 대의에는 봉황문과 화문, 격자문, 연화문 등의 둥근 무늬가 전체에 걸쳐 정연하게 시문되어 있으며, 내의에는 흰색의 연꽃무늬가 장식되어 있다. 본존불 하단 좌·우로는 협시보살상을 배치하였는데 두 상 모두 손 모습과 천의(天衣)의 표현만 약간 다를 뿐 본존불을 향해 몸을 틀고 있는 신체의 자세 및 벌리고 서 있는 발의 모습, 인물의 크기와 형태, 보관, 지물 등이 거의 대칭을 이루고 있다. 화면 상단 본존불상의 머리 좌·우에는 가섭존자와 아난존자가 자리하였으며, 배경으로는 황·적·청·녹색의 색구름대(彩雲帶)를 깔고 감청색의 하늘을 두어 공간감을 부여해주고 있다. 또한 그림 내부 하단 가운데 쪽에 왕실의 안위를 발원하는 내용의 글이 있으며, 테두리 하단부에는 화기가 남아 있다. 이 괘불탱은 괘불탱으로서는 비교적 빠른 시기에 해당하는 1705년 조성의 작품으로, 둥글넓적해진 얼굴에 근엄함이 엿보이며, 어깨가 약간 올라가는 등 17세기로부터 18세기로 넘어 가는 과도기적 특징을 잘 보여주고 있을 뿐만 아니라, 보살상이 아닌 부처상으로써 지물(연꽃가지)을 드는 새로운 도상의 예를 보여주어 조선시대 불화 연구에 학술적 자료로서의 가치가 크다. This hanging Buddhist painting in the ojondo (painting consisting of a main Buddha flanked by four Buddhist figures) style depicts three standing Buddhist figures, with Mahākāśyapa and Ananda positioned on each side of the main Buddha’s head. The main Buddha is depicted wearing a red tonggyeon (a robe covering both shoulders) and a grayish blue undergarment. The Buddha’s head alone measures 180 cm in length, while its mandorla measures 273 cm across, and his body fills the huge canvas, which measures over 10 m in height. 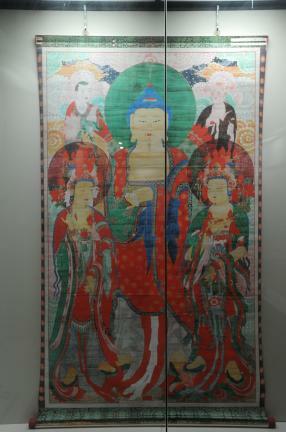 The Buddha’s red robe is decorated with regular circular patterns containing phoenix, flower, lattice and lotus flower designs, while his undergarment is adorned with white lotus flower patterns. The main Buddha is flanked by two Buddhist figures, Mahākāśyapa and Ananda, positioned to the left and right of his head. 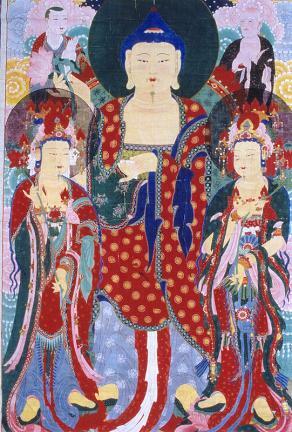 Apart from the differences in their hand gestures and their divine garment, the two figures exhibit almost the same appearance, particularly in the way they are standing with their legs spread wide apart with their bodies turned toward the Buddha, in their height and form, the jeweled crown on their heads, and the objects they are holding. The background to the three figures is filled with soft yellow, red, blue and green clouds against a navy blue sky that create an illusion of depth and space on a flat surface. A prayer for the health of the royal family is written in the lower middle section of the painting, and a record of the painting remains along the bottom border. Produced in 1705, this painting ranks among the earliest known examples of hanging paintings. It exhibits the typical characteristics of Buddhist paintings made during the transition period from the 17th century to the 18th century, including the Buddha’s large, round face, which conveys an air of dignity, and the slightly raised shoulders. The painting holds considerable value for the study of Buddhist paintings of the Joseon Dynasty as it presents a new Buddhist image, with the Buddha rather than a Bodhisattva holding an object (lotus flower) in his hands.